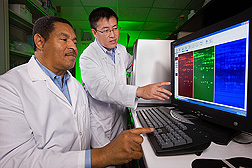 Plant pathologist Robert Brown (left) and postdoctoral research associate Meng Luo review results of a proteomics experiment to identify maize kernel proteins that are associated with aflatoxin resistance. Aflatoxins are poisons produced by the fungus Aspergillus flavus after it infects agricultural commodities, such as corn. Contamination of corn with aflatoxin causes financial loss to growers and is a potential health hazard to animals and humans. Found in soil, on crops, and in air, A. flavus produces the toxins after it infects corn kernels. Various approaches to eliminating aflatoxin from susceptible crops have been proposed. But because A. flavus infects susceptible crops before harvest, host resistance is a widely explored strategy. Now, six new maize inbred lines with resistance to aflatoxin contamination have been registered in the United States. Agricultural Research Service plant pathologist Robert Brown and colleague Abebe Menkir, with the Nigeria-based International Institute of Tropical Agriculture (IITA), developed the new germplasm after extensively crossbreeding corn lines that discourage growth of the fungus. Brown is with the ARS Food and Feed Safety Research Unit, one of seven units at the ARS Southern Regional Research Center in New Orleans, Louisiana. Technician Cesar Ambrogio sets up the kernel screening assay to measure the amount of aflatoxin in kernels of maize lines developed through the ARS collaboration with IITA-Nigeria. The six new lines became registered after more than 10 years of collaboration between Brown and Menkir. “When we started this work, there were several U.S. maize lines that were resistant to aflatoxin, but those lines were not agronomically attractive,” says Brown. Because ear-rot-causing fungi are common in maize in West and Central Africa, Brown had sought to screen maize lines from these African and other tropical regions. The work started with Menkir selecting lines that had different levels of resistance to ear-rotting fungi, including Aspergillus, Fusarium, and Verticillium, and sending them to Brown to assess their potential for aflatoxin resistance. 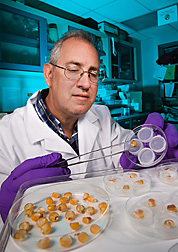 Brown used a highly effective and rapid kernel-screening assay (KSA) to separate resistant seeds from nonresistant ones. He identified several lines that showed a low accumulation of aflatoxin, and those were selected to begin making crosses with U.S. lines. Menkir tested those lines in Africa and then self-pollinated lines he had selected for good agronomic traits and resistance to foliar diseases. After the fourth generation of selection and self-pollination, germplasm was sent to the United States for KSA testing. Lines showing promise in the KSA were then field-tested in Africa for aflatoxin accumulation. Seed of the six inbred lines will be maintained at the ARS National Center for Genetic Resources Preservation in Fort Collins, Colorado. This seed can be used by researchers in developing new lines. The IITA will also multiply and maintain seed of the six inbreds. For laboratory research use, small quantities of seed of these lines can also be obtained from the maize breeding unit at IITA in Ibadan, Nigeria. In 2009, ARS researchers at the North Central Regional Plant Introduction Station in Ames, Iowa, will conduct trials to ensure the germplasm is disease free—a necessary step for certification. “Any genetic material from a foreign country must be examined to ensure that no disease agent is present and that the material is safe to grow here,” say Brown. The article describing the development and registration of the six maize lines was published in the September 2008 Journal of Plant Registrations. After being certified for public release—most likely in late 2009, according to Brown—the six inbred lines can be used in public or private breeding programs to develop aflatoxin-resistant corn lines for use by growers both nationally and internationally. This could lead to future savings of millions of dollars to growers as a result of the elimination of aflatoxin contamination of corn. Brown has also used the KSA to highlight resistance mechanisms. That work eventually led to the discovery of several “resistance-associated proteins.” In some of these studies, a team led by Brown used a reporter gene in conjunction with the assay to assess the amount of fungal growth in kernels. This reporter gene continuously expresses an enzyme as long as A. flavus is growing. “In other words, the reporter gene is ‘reporting’ on the growth of the fungus,” says Brown. The team then compared that fungal growth with aflatoxin accumulation. These studies were highlighted in the journal Mycotoxin Research in January 2006. Brown is also using proteomics to identify proteins produced by corn genes associated with resistance. Recently, a corn kernel protein, PR-10, was determined to be present at higher levels in resistant corn lines than in susceptible ones. In laboratory tests, this protein was found to destroy A. flavus RNA and to inhibit fungal growth. These results show that this protein may play an important role in corn resistance against A. flavus growth and aflatoxin contamination. “Enhancing the expression of this protein in commercially useful corn lines could help us develop more lines that resist aflatoxin contamination,” says Brown. This would, in turn, enhance the safety of feed and food for animals and humans and increase financial savings to growers. The study was published by Brown and colleagues in the journal Phytopathology in 2006.—By Rosalie Marion Bliss, Agricultural Research Service Information Staff. This research is part of Food Safety, an ARS national program (#108) described on the World Wide Web at www.nps.ars.usda.gov. Robert L. Brown is in the USDA-ARS Food and Feed Safety Research Unit, Southern Regional Research Center, 1100 Robert E. Lee Blvd., Bldg. 001, New Orleans, LA 70124; phone (504) 286-4359, fax (504) 286-4419. "Hardy New Corn Lines Resist Toxic Fungi" was published in the October 2009 issue of Agricultural Research magazine.